This transfer chute at an iron ore port processing facility was originally lined with metal wear liners. The highly abrasive material wore through these metal liners prematurely and unpredictably, leading to costly production loss as the parent metal began wearing through to cause ore spillage and loss of chute availability. With the use of these alternative metal liners, this transfer chute required maintenance every 4 to 6 weeks. After close consultation with the client, Corrosion Engineering custom-designed and manufactured a CorroTile wear lining system to protect this chute from severe abrasion and wear. 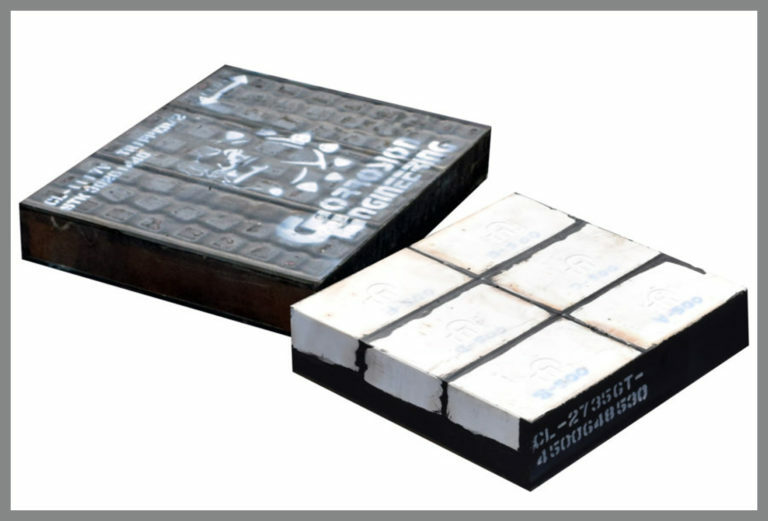 This CorroTile system consisted of two types of our proprietary ceramic compounds targeting specific wear areas. CorroTile BLUE was installed throughout the entire chute except for the primary wear areas. Isolated high wear areas in the corners of the transfer chute caused by the side of the ore stream off the impact plate were lined with next generation CorroTile G-Series. With the use of our custom CorroTile lining system, the client was able to extend the life of this transfer chute from 4 weeks to over 47 weeks and counting without the need to worry about unpredictable wear or production loss. Our custom CorroTile lining system for this transfer chute proved highly cost-effective, lasting over 10 times the previous wear liners while eliminating maintenance, and increasing profitability.